Related: Are French fries the new fast-food battleground? 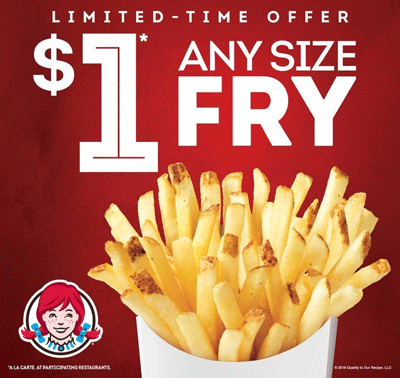 Dublin, Ohio-based Wendy’s, for example, offered $1 Any Size Fries Nov. 30-Dec. 26 at the 6,600-unit brand. San Diego, Calif.-based Jack in the Box last summer introduced a “Sauced & Loaded Fries” promotion that started at $3 for its 2,200 locations. And Taco Bell, the Irvine, Calif.-based division of Yum! Brands Inc., last year introduced Nacho Fries on its Dollar Cravings Menu, and the 7,000-unit brand said it was its most successful new menu item, selling 53 million orders. “Volatility in commodity prices is a nightmare for restaurants,” said Leslie Kerr, founder of Boston-based Intellaprice, a restaurant consulting firm. “It’s hard to resist a knee-jerk reaction, and often operators will take a price increase to compensate for cost spikes. Those price increases could impact planned promotions across the restaurant landscape. One-dollar fries frequently pop up as a successful traffic driver, such as the offers at Tampa, Fla.-based Checker’s/Rally’s, which gives free fries as part of its loyalty program signup and has run $1 specials in the past. “As for promotions,” said pricing expert Kerr, “it’s sort of a good news/bad news situation. Any commodity price increases come at an unfortunate time, Kerr added, because many brands are dealing with recent labor cost increases because of minimum wage rates, which rose in more than 20 states at the beginning of the year.